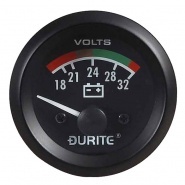 Durite 12V-24V dc illuminated voltmeter with red LCD display. 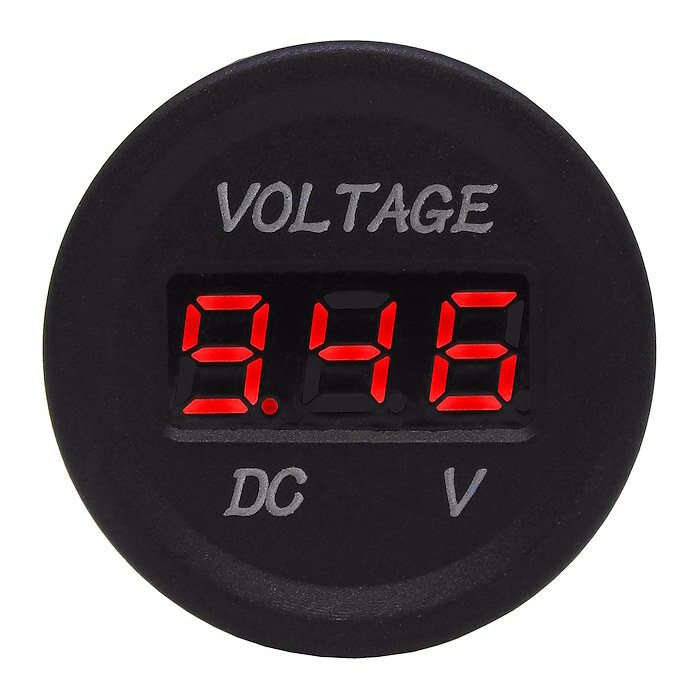 Bright red LED/LCD style voltage display. 0-601-51 Cigarette lighter front panel single mounting bracket - 28mm hole. 0-601-52 Cigarette lighter rear panel single mounting bracket - 28mm hole. 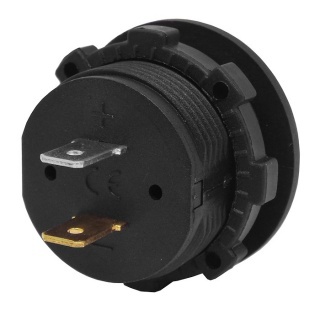 0-601-61 Power socket single mounting housing - 28mm hole. 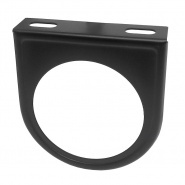 0-608-00 Cigarette lighter mounting bracket - 28mm hole. 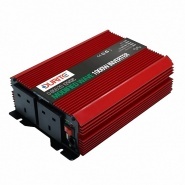 Ensure that the Voltmeter voltage (6-30VDC) matches the vehicle or system voltage (including illumination). Switch off ignition and remove key. Disconnect the battery (earth terminal first). Note: Before disconnecting the battery make sure all system start up codes are known, i.e. coded radios etc. 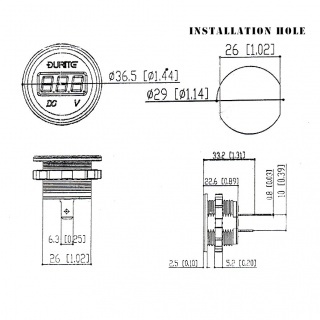 Choose a suitable location for the gauge with adequate access to the rear of the gauge for connections and fixings. Cut a 28mm diameter hole at the chosen location for the gauge. 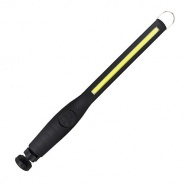 Push the gauge into the hole and secure using the back-nut. The panel maximum thickness must not exceed 6mm. Connect the terminal marked “+” to a suitable ignition controlled fuse supply or positive feed, connect the terminal marked “-” to earth or negative feed. When voltage is supplied to the gauge it will display the voltage detected. Check all connections are correct and secure. Reconnect the battery (earth terminal last). Switch on ignition and check that the voltmeter registers battery voltage. Switch on panel lamps and check that the gauge illuminates. DO NOT Connect the voltmeter in series with a load. DO Ensure there is adequate space for access to the rear of the voltmeter. 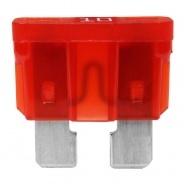 Fit fuses if none are present in the circuits being monitored. Remember voltmeters are connected in parallel with the circuit being monitored. 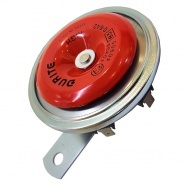 Durite 52mm single hole steel, under dashboard mounting panel for meters, gauges and clocks. 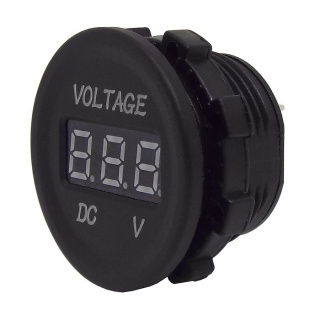 24V battery condition voltmeter or battery discharge indicator or BDI, 90° sweep, requires 52mm dashboard hole.